The HDCV-3-T is a BNC to HDMI converter that supports HD-TVI to HDMI, AHD to HDMI, and HDCVI to HDMI video conversion. This video converter is typically used to display live video from HD security cameras on a TV or monitor via HDMI. Click here to see how this device can be used to display live surveillance video at a retail store entrance. It works with all HD-TVI video resolutions: 720p, 1080p, 3 megapixel, 4 megapixel, 5 megapixel, and 8 megapixel (4K). In addition to HD-TVI cameras, the HDCV-3-T also works with AHD and HD-CVI cameras. Please see the complete specification below. This video converter accepts BNC video input from one HD surveillance camera via coax cable and sends the video to the HDMI output. Click here to view a installation diagram. The HDMI video output is 1080p resolution. Multiple HDCV-3-T converters can be used as a video splitter to connect one TVI camera to multiple HDMI monitors. This is done using the BNC loop output which allows you to send the native HD video signal (HD-TVI, HD-CVI, or AHD) to another device, such as a surveillance DVR or second converter. If you are looking for a solution to display video from multiple security cameras on a single monitor, please check out our HD CCTV video multiplexer that is also compatible with HD-TVI, HD-CVI, and AHD cameras. We also sell complete systems to display live video from security cameras on a TV. The HDCV-3-T does not support non-HD analog cameras. Please click here if you are looking for BNC to HDMI converter for analog CCTV cameras. This is how installers connect the HDCV-3-T.
An HD-TVI security camera is connected to the BNC video input using coax cable that is compatible with HD-TVI cameras. AHD and HD-CVI cameras can also be used. The HDMI output is connected to a TV monitor using an HDMI cable. The 5V DC Micro USB power supply is connected to the device and a power source. The LED lights will indicate the status. Optional: the BNC video output can be connected to an HD-TVI compatible DVR or to a second HDCV-3-T converter. This will enable live video display on an additional monitor. Update! The current version HDCV-3 that CCTV Camera Pros supplies supports HD over Coax resolutions higher than 1080p and the body has changed slightly. On the side of the device where the BNC input / loop output is located, there are now LEDs that specify what resolution has been detected by the video input. In addition there is a 75Ω / HI-Z switch. If you are using the BNC loop output (optional), this switch should be set to HI-Z. If you are only using the HDMI output (without the BNC loop), this should be set to the 75Ω setting. Many customers use our HDCV-3 video converter so that they can display a live view of their security camera on a standard TV using the HDMI video input. This is how it works. RG59 coax cable with BNC connectors is used to connect the security camera to the input of the converter. Installers can also use these pre-made Siamese security camera cables with power cable. HDMI cable is used to connect the HDMI output of the converter to the HDMI input of the TV. The above wiring diagram shows how to connect an HD-TVI CCTV camera to an HDMI monitor and surveillance DVR. Because many TVI DVRs do not have loop outputs (like traditional CCTV DVRs do), the BNC loop output of the HDVC-3-T is used to share the TVI video signal between 2 devices. In this diagram, we share video from a single TVI security camera with an HD TV and a hybrid CCTV / HD surveillance DVR. Important Note: Using the loop output is optional. Some customers only want to view their camera live on a TV and DO NOT require recording from a DVR. In this case, installers will only use the HDMI output to connect the HD-TVI camera to a TV. The above diagram shows how an HD-TVI-BL180 security camera can be connected to two high definition TVs using two HDCV-3-T converters that are linked together using an RG59 jumper cable. Here is how it works. The HD-TVI camera is connected to the HDVC-3-T video converter using RG59 coax cable. You can use this premade Siamese cables for HD security cameras if you want to power the camera from a source near the first converter. Or if you are powering the camera at the location where the camera is installed, you can use these RG59 jumper cables. The video converter has a BNC loop output which lets you connect the video to a second device using a coax jumper cable. In this installation, we connect it to a second video converter using a premade RG59 jumper / patch cable. A 3rd video converter could be connected to the 2nd one this same way if an additional monitor was needed. You can connect as many monitors as you need by adding additional HDVC-3-T video converters. Last, use an HDMI cable to connect the HDMI output of each video converter to a TV / monitor. The HDCV-3-T can be used by retail stores to display a live surveillance video feed at the store entrance. 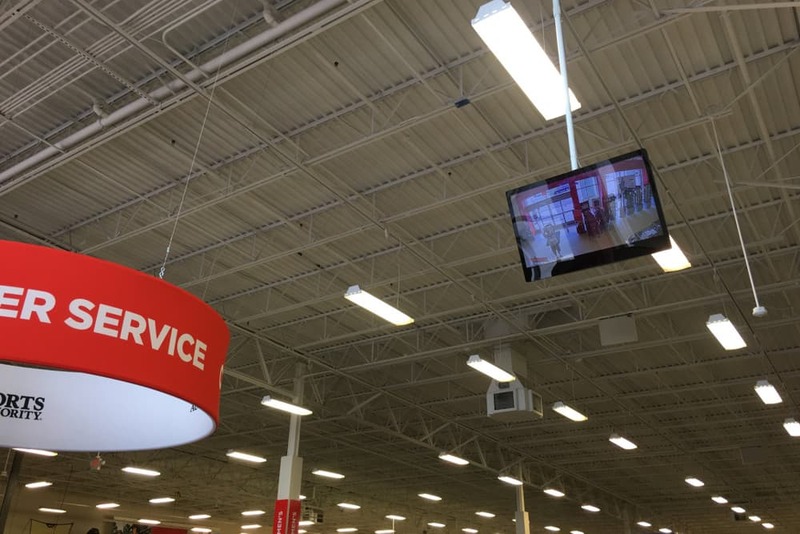 This type of installation is very typically used by major retail chains. It creates a theft deterrence and helps customers feel safe knowing that the store uses security cameras. You can find HD-TVI cameras here that are compatible with the HDCV-3-T video converter. The HDCV-3 provides the ultimate compatibility with almost all HD over Coax and analog CCTV cameras available. Security camera manufacturers around the world use a variety of video standards including HDCVI, AHD, HD-TVI, and CVBS. This security camera to HDMI video converter is compatible with all of them including (but not limited to) cameras from CCTV Camera Pros, Samsung, Lorex, Night Owl, Swann, Samsung, QSee, Defender. If you need help determining if this converter is compatible with your camera, please click to contact us and we will help.